Now you can "ReThink911" all year! 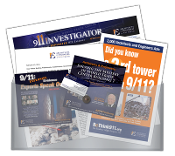 100 PACK - We have repackaged our standard street brochure for ReThink911 September 2013! 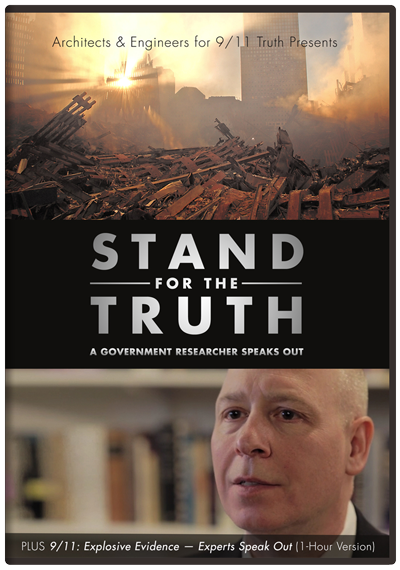 This is the powerful documentary film by Architects & Engineers for 9/11 Truth in a special cardboard sleeve for the ReThink911 campaign. These eye-catching banners will help you deliver the news that more than 2,500 architects and engineers are trying to wake up the public. These oversize vinyl banners, with grommets, are perfect backdrops for your events and outreach! This attention grabbing 24” wide by 18” tall coroplast yard sign is your primary street-level attention grabber. Let them start the conversation! You will be a walking advertisement and educator for Building 7! Be sure to record videos with your t-shirts and send them in to AE911Truth. Get your friends/family/colleagues asking questions with this custom baseball cap of 100% twill cotton and velcro strap closure. Put this 3“ x 10” weather-proof ReThink911 bumper sticker on your car – and anything that you own!